Over the past few weeks Sarah-Jane has been in touch with the fabulous team at Escuela de Arte Pancho Lasso, the Lanzarote School of Art. The discussions between them led to Sarah-Jane delivering a presentation to many of their students, lecturers and alumni last week. The presentation topic was about Sarah-Jane’s ‘Creative Experience’ to-date, and her artistic journey so far. It also provided an opportunity to talk about The Lacuna Studios and what we intend to bring to the island. Sarah-Jane was introduced by Carmen Miranda a lecturer from the college. Sarah-Jane talked about her formal art education from GCSE through to her PGCE. The progression initially led to Sarah-Jane being a secondary school teacher in Leeds. However, after five years, she decided that this wasn’t the career choice that best suited her and she moved to Cyprus to undertake her Masters Degree with the support of artist and educator Stass Paraskos at the Cyprus College of Art. Stass had a huge influence on not only her art but also on her vision of her career and indeed her whole life for the future. Sarah-Jane returned from Cyprus and set up as an Artist Educator, working creatively in many varied locations. Some examples are The Tetley Art Gallery, Leeds Museums, Cannon Hall Museum Park and Gardens, Arts Council England, The Arts Council Collection, The National Arts Education Archive, The Marks and Spencer Archive and National Portfolio Galleries such as the Yorkshire Sculpture Park. Sarah-Jane has developed her own publishing house Next Generation Publications which has been able to publish a number of books created by participating children and relating to projects she has delivered over a number of years (these books are now available from the British Library). The final section of Sarah-Jane’s talk explained about how her past experiences and teachings from Stass have led to the creation of The Lacuna Studios. She explained that how, along with Simon Turner, they aim to create residential art studios on the island of Lanzarote to provide facilities for both local and international artists and art students to learn and create in relaxed surroundings with no obligations. Sarah-Jane talked about her experiences with other influential artists and her involvement with The Frozen Academy, an arts collective headed by Josef Danek. She also spoke of her regular involvement in the Larroque Arts Festival, directed by Professor Kenneth G. Hay from the Gallerie la Vielle Poste in Larroque. This is an international Arts Festival based in the rural village of Larroque in the South of France. The Lacuna Studios is proud to twin with for 2019 and deliver the Lanzarote Arts Festival at the end of July through to the beginning of August. Sarah-Jane opened up the floor for questions from the audience with some very interested students keen to find out more about The Lacuna Studios, the Lanzarote Arts Festival and also about Sarah-Jane’s history. The Escuela de Arte Pancho Lasso presented Sarah-Jane with a copy of the book telling the History of Escuela de Arte Pancho Lasso, to mark the occasion. The book is now a part of The Lacuna Studios Library which will be based at and accessible through the studios. Sarah Jane Mason of The Lacuna Studios talks about her recent series of studies, sketches and paintings. Our co-founder Simon has been surprising beach goers around Lanzarote with his Landart since we arrived on the island and has been taking every opportunity whenever we travel to deliver a piece of Landart. This hasn’t gone un-noticed and a couple of weeks ago Simon was approached by a Lanzarote publication Lanzarote37Grad a popular, local based magazine that has been around for a number of years. Simon was invited to talk about his work and about The Lacuna Studios. Simon Turner in the evening at the Playa de Atrás: he loves to create his transitory works without any audience attention and is nevertheless pleased when they are later taken over by playing children, before the art is then recaptured by the sea. The first time I encountered Simon Turner’s Land-Art on the Internet was pictures of his artwork on his Facebook page. I was fascinated immediately, how beautiful it looked! Who is the artist, I asked myself, and how does he do that and with what? How does he get such huge mandalas, because when he is right next to the piece he has hardly any overview of the entire work. Could he provide us with a photo for our Lanzarote37° annual calendar so that our readers could enjoy his art as much as I did? I really wanted to get to know this artist and so I sent him a message and asked to meet him. Simon responded promptly and a few days later he and his girlfriend Sarah-Jane Mason, who is also an artist, sat with me in the kitchen and I got chatting quickly with Simon and Sarah, both from the UK. The love of Lanzarote creates a connecting element, and their refreshingly open and unpretentious manner lovingly makes them ignore the fact that my English has suffered a noticeable decline after so many years without sustained listening and speaking practice. Simon was also very happy to be present in our 2019 calendar. I find out that the two had met each other many years before they became a couple, had re-joined each other in the depths of social networking, and now, after meeting for a coffee in Leeds, they are inseparable. The thought makes both of them smile while their eyes meet intimately. Somehow one immediately notices that the two - at least in my impression - are similar. Neither Simon nor Sarah would bend for commerce or consumption, both live consistently according to their nature and are definitely willing to sacrifice themselves in order to get closer to their goal. Their goal is to set up an open art house in Lanzarote, where artists from all over the world can live and work as long as they want. Simon and Sarah, with consistent systematics because their planned art house, prefer to approach a climate-friendly area, but at the same time Great Britain should not be too far away. They agreed quite quickly on the Canary Islands, but which of the now official eight would be the right one? Simon and Sarah drove all the Canary Islands by car, methodically and purposefully, Simon glued to the driver’s seat and Sarah with a map on her lap. Sarah directed Simon through every single village from Gran Canaria to Fuerteventura, and finally to Lanzarote; where immediately after they had travelled the road from the airport straight to the north, and through the Malpais at the foot of Monte Corona, there was the mighty island. Here on Lanzarote the Art House was to arise. On the island, working as “Workawayers” exchanging work for accommodation they have been employed in the most diverse jobs, in airlines or in the holiday home care as well as for art projects of individual communities or even the island government. Always with the vision in mind how to make their Art House similar to a project in Cyprus where Sarah lived and worked for a long time, the campus of today’s ‘Cyprus College of Art’ in the coastal city of Lemba, which the Cypriot painter Stass Paraskos founded. Simon and Sarah’s dream, would be a place in Lanzarote where artists and those with an interest in art come together to live and work with each other side by side. What is special about the planned Lanzarotian art school should above all be that really, everyone is welcome that has a lust for the Arts. Education and training will not play a selective role; the desire to create will be what counts, not some previous education or certificate of study. Carefully mentioned doubts on my part about suitable real estate on our island given the high prices could ever be found, but the young artists do not seem easy to depress. Both have a lot of project experience in the field of art and are keen to be able to access the corresponding EU funds. The first hurdle to cross when the project was set up was a suitable real estate property needed to be found. It seems like a goliath task to me. But I think so too. It would be a project that Lanzarote, the island that has benefited so much from the creations of an artist like César Marique is still profiting well. Where, on the Canary Islands, if not on our island, could a modern, open-to-all art school be better located? The South of Lanzarote hides many hidden treasures. The Lacuna Studios team are taking their time to explore the hidden corners of the island, the special places that aren’t listed on the tourist maps. Every now and again we stumble across something very spectacular! A few weeks ago, The Lacuna Studios founders Sarah-Jane Mason and Simon Turner happened upon one of these fabulous spaces, the amazing gallery and house that belongs to Dieter Noss. This is really a one off space and simply must be seen to be believed! The whole outdoor area has been transformed into a sculptural gallery with huge oversized plugs and tools draped across the landscape, wire portraits in profile hung on the walls and chairs with spikes or cushions as a base so choose carefully before taking a seat! There isn’t an inch of outdoor space that isn’t covered with fabulous pieces of art. Dieter Noss is a German, contemporary painter, sculptor and designer who currently splits his time between two bases; Munich in Germany and Las Brenas, Lanzarote. He enjoys creating artworks out of nothing, junk, rubbish, things that have been discarded or are just lying around, waiting to find a purpose. He finds a lot of inspiration in the Canary Islands and particularly enjoys finding materials in amongst the floatsam and jetsum off the local beaches; rusted metals, chunks of debris and colourful plastics all become pliable materials in Noss’s hands. Inside the house the awe-inspiring treasure chest, a true commitment to art and living as an artist is continued in this living, breathing gallery space. Each room in the house takes your breath away as you enter. Large scale paintings hang proud above eclectic furniture; sketchpads are mounted in abstract patterns on the wall and stacked haphazardly by the sofa. You get a real sense of this as an artist’s space for exhibiting and displaying, but also for the inspiration and creation of new pieces. When we visited, Noss had left, only the day before, to stay in Munich for a while and it was a kind neighbour who showed us around this inspirational and one of a kind space, pointing out his favourite parts and showing us around the inside spaces. We are very grateful for his generosity with his time and also his patience with Sarah-Jane’s developing Spanish! We hope that when we next visit we can repay his kindness in some way but also meet the artist himself who has created such a special space. Bettina también nos habló sobre algunos de los proyectos de César y cómo sus diseños a menudo tomaban forma a través de él dibujando diseños en la arena. Similar a las técnicas implementadas a través de las intervenciones artísticas terrestres de Simon alrededor de la isla. Los Lacuna Studios tuvieron la suerte de encontrarse con Bettina Bork en Haría y en Arte De Obra, donde felizmente pasó un par de horas mostrándonos el centro y explicándonos parte del trabajo en el que ha estado involucrada recientemente. Uno de los proyectos más emocionantes es una película, llena de miembros de las comunidades locales en Haría y sus alrededores, que ha estado en desarrollo durante más de seis años. Recientemente ha recibido reconocimiento en la feria de turismo ético, ITB, (la feria de viajes líder en el mundo) en Berlín y se estrenará en su edición final en una celebración del centenario de Manrique. El centro en sí es hermoso, con paredes blancas y luminosas, grandes espacios comunes y encantadores espacios verdes al aire libre para la colaboración y el intercambio. Bettina estaba interesada en enfatizar que esta es la parte más importante del centro: proporcionar un tipo de turismo ético para la isla y proporcionar una base para el intercambio europeo y quizás incluso intercontinental. Bettina también estaba muy interesada en aprender sobre el trabajo que crean Sarah-Jane y Simon. Realmente esperamos poder hacer arreglos para trabajar juntos en el futuro; tal vez en un proyecto para celebrar el centenario de Manrique? A few weeks ago The Lacuna Studios were really excited when they had the opportunity to meet up with someone with similar beliefs and ethics to both Sarah-Jane and Simon; living, working and promoting European cultural exchange in the heart of the island of Lanzarote. Bettina Bork is an architect and designer who studied and apprenticed with César Manrique between 1986-1992. Then, in 1993 she renovated a small, traditional house in Haria with the cooperation of the local mayor. Following this, Bettina continued to renovate traditional properties, this time choosing a larger house which first became a small hotel and eventually in 2003 was set up as a Cultural Centre ‘Arte de Obra’. A beautiful collection of fabulous apartments finished to perfection. Bettina also talked to us about some of César’s projects and how his designs often took shape through him drawing designs in the sand. Similar to techniques implemented through Simon’s land art interventions around the island. The Lacuna Studios were really lucky to meet with Bettina Bork in Haria and at Arte De Obra, where she happily spent a couple of hours showing us around the centre and explaining some of the work that she has been involved with recently. One of the most exciting projects is a film, full of members of the local communities in and around Haria that has been in development for over six years. It has recently received recognition at the ethical tourism fair, ITB, (the worlds’ leading travel trade fair) in Berlin and will be premiered in its final edit at a celebration of Manrique’s centenary. The centre itself is gorgeous with bright, white walls, large communal spaces and lovely green outdoor spots for collaboration and exchange. Bettina was keen to emphasise that this is the most important part of the centre – to provide an ethical sort of tourism for the island and to provide a base for European and perhaps even cross-continental exchange. Bettina was also very keen to learn about the work that both Sarah-Jane and Simon create. We really hope that we can arrange to work together in the future; perhaps on a project to celebrate Manrique’s centenary? Bettina Bork es una arquitecta y diseñadora que estudió y fue aprendiz de César Manrique entre 1986 y 1992. Luego, en 1993, renovó una pequeña casa tradicional en Haría con la cooperación del alcalde local. Después de esto, Bettina continuó renovando propiedades tradicionales, esta vez eligiendo una casa más grande que primero se convirtió en un pequeño hotel y finalmente en 2003 se estableció como un Centro Cultural ‘Arte de Obra’. Una hermosa colección de apartamentos fabulosos terminados a la perfección. La inspiración para Arte de Obra vino del proyecto similar de Manrique 'El Almacen’ en Arrecife; una antigua casa de estudio renovada para intercambios culturales y de artistas, colaboraciones, estudios, residencias y exposiciones que ha estado en funcionamiento desde 1986. Bettina dice de la influencia de El Almacen, “Desde mi propia experiencia positiva desarrollé la idea de continuar algo similar. Tuve la idea de crear o continuar un instrumento para que estudiantes de diferentes naciones se conectaran y establecieran contacto ”. We are a little behind with where we are upto with our adventure as it has been a very busy few weeks here at The Lacuna Studios in Lanzarote. Sarah-Jane recently returned to the UK to deliver a number of sessions for the Yorkshire Sculpture Park. These sessions included walk-talk-make tours of the grounds and outdoor sculpture building workshops for the Formal Education Programme. The main focus of her visit was to launch the Outdoor Artsparks resource at YSP and Canon Hall which was funded by Arts Council England and created in partnership with Barnsley Museums and Yorkshire Sculpture Park; this resource is aimed at Teachers, Community and Youth Leaders, or Parents wanting to enhance their use of the outdoor spaces that the partner organisations can offer. The initiative was well received by teachers, middle and senior school management, as well as the staff of both partner organisations. Other sessions are also now being delivered at Worsborough Mill Museum and Country Park. In addition Sarah-Jane delivered a specially deisgned day at YSP where children and young people could work towards achieving an Arts Award in just the one day. The day consisted of a range of creative activities including drawing using only found objects, rubbings, and hapazome printing (a traditional Japanese method of printmaking where pigments from flowers and leaves are pumelled directly into cloth or paper). This is part of a wider programme of learning and experiences offered by the Family Learning Programme at the Yorkshire Sculpture Park. Sarah-Jane also found time to catch up with the multi award winning drama group Inspirations Theatre Company, Chesterfield, to lend a helping hand with backdrops and choreography for their upcoming performances of Singing in the rain (Junior) at Donut Creative Arts Studio Chesterfield. A short, busy but very successful visit to the UK. On her return to Lanzarote Sarah-Jane continued the Workaway placement with Simon at Casitas Tabayesco during their final weeks with the lovely Caroline and Rich, on completion of the placement in Tabayesco Simon and Sarah-Jane have now moved to a new Workaway placement at Secret Chill, a beautiful hidden retreat in the heart of Lanzarote, more info to follow……………. Land Art - ‘Working with nature’ or ‘Geologic litter’? Simon has for many years worked with the environment to deliver transient art pieces which are temporary and are reclaimed by nature to return it to its natural state. Moving to Lanzarote has given much more opportunity to create and to showcase his works often with the pieces being created in hidden corners of the island with the sea reclaiming the art within hours. Simon also works to incorporate man made waste in his sculptures, highlighting the damage done to beaches and to the oceans, not only in the Canaries but worldwide. Simon is a keen believer in the #leaveitasyoufoundit campaign which encourages Land Artists to do just that and leave the land as they found it.Something which has recently been echoed by the Cabildo de Lanzarote in their campaign ‘Lanzarote is perfect the way it is, without moving a stone‘, highlighting the damage that can be done by the many stone towers and stone messages left around the island every year by tourists. Whislt these are often left as a memory, the towers can cause lasting damage to the environment especially within the UNSECO Biosphere which is often never thought about by the constructor of the towers. In some places there are now hundreds of stone towers and love hearts littering the landscape, these are also referred to as geologic litter. Simon always dismantles any towers created and allows all other transient pieces to be reclaimed by the sea. Durante muchos años, Simon de The Lacuna Studios ha creado intervenciones terrestres en todo el mundo. Mientras no invita a la etiqueta de eco-guerrero, Simon ha trabajado para proteger el medioambiente y para crear conciencia sobre la importancia de cómo usamos el planeta, con sus intervenciones artísticas y también su upcycling que va desde paletas de madera hasta barriles de cerveza y cámaras de aire (echa un vistazo a las joyas recicladas de Simon en PNEÜ Simon ha trabajado durante muchos años con el medio ambiente para entregar piezas de arte transitorias que son temporales y son recuperadas por la naturaleza para devolverlo a su estado natural. Mudarse a Lanzarote le ha dado muchas más oportunidades para crear y exhibir sus obras con las piezas que se están creando en rincones escondidos de la isla, donde el mar recupera el arte en cuestión de horas. Simon también trabaja para incorporar desechos hechos por el hombre en sus esculturas, destacando el daño causado a las playas y los océanos, no solo en Canarias, sino en todo el mundo. Simon es un entusiasta creyente en la campaña #leaveitasyoufoundit que anima a Land Artists a hacer justamente eso y a dejar la tierra tal como la encontraron. Algo que ha sido recientemente repetido por el Cabildo de Lanzarote en su campaña ’Lanzarote es perfecto como es, sin moverse a la piedra ’, destacando el daño que pueden causar las numerosas torres de piedra y los mensajes de piedra que dejan los turistas en la isla cada año. Si bien estos a menudo se dejan como un recuerdo, las torres pueden causar daños duraderos al medio ambiente, especialmente dentro de la Biosfera UNSECO, que a menudo nunca se piensa en el constructor de las torres. En algunos lugares ahora hay cientos de torres de piedra y corazones que ensucian el paisaje, estos también se conocen como camas geológicas. Simon siempre desmantela cualquier torre creada y permite que todas las otras piezas transitorias sean recuperadas por el mar. Si tiene puntos de vista sobre el arte de la tierra o el daño que pueden causar las torres de piedra, póngase en contacto con Simon o The Lacuna Studios a través de nuestro sitio web thelacunastudios.com o a través de Facebook. The Lacuna Studios put it down on canvas - fast! We’ve been pretty busy over at The Lacuna Studios HQ, the last few weeks we’ve still been cracking on with our wonderful workaway at the beautiful Casitas Tabayesco, we’ve been vehicle hunting so that we aren’t pouring money out on hire cars (hopefully we have secured the TLS MACHINE! ), we’ve created some land art and a little something extra too.We’re also super proud of the fabulous Emilee J Turner (Simon’s daughter) who has just completed her final year at Sheffield Hallam University. 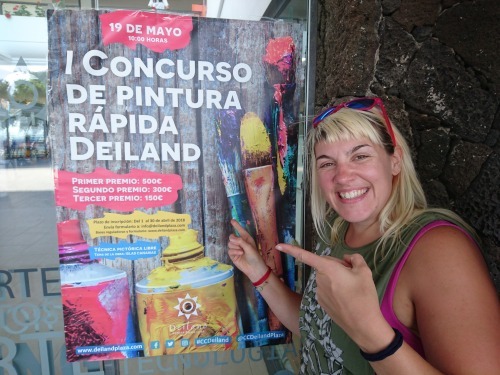 So that little bit of news …….. Sarah-Jane has had her application for the ‘Fast Painting Contest!’ in Deiland in Lanzarote accepted and has been selected from a large number of applicants to compete in a timed paint competition on Saturday, May 19 starting at 10:00. 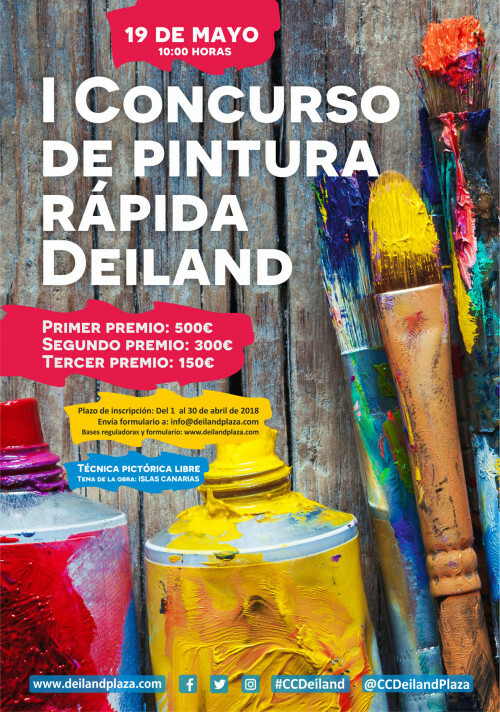 Sarah-Jane has to deliver a painting based on the theme of “The Canary Islands”, the competition will take place on Saturday in the center of the Deiland complex, so come down and give your support! Hemos estado muy ocupados en el cuartel general de The Lacuna Studios, en las últimas semanas hemos estado trabajando con nuestro maravilloso trabajo en la hermosa Casitas Tabayesco, hemos estado buscando vehículos para no gastar dinero en ¡Alquile automóviles (esperamos haber asegurado la MÁQUINA TLS! ), hemos creado un poco de arte de la tierra y un poco de algo extra también. También estamos muy orgullosos de la fabulosa Emilee J Turner (hija de Simon) que acaba de completar su último año. en la Universidad Sheffield Hallam. Así que ese poco más de noticias …….. Sarah-Jane ha tenido su solicitud para el 'Concurso pintura rápido! 'en Deiland en Lanzarote aceptó y ha sido seleccionada entre un gran número de solicitantes para competir en una competencia de pintura cronometrada el sábado 19 de mayo a partir de las 10:00.Sarah-Jane tiene que entregar una pintura basada en el tema de “Las Islas Canarias”, la competencia tendrá lugar durante el sábado en el centro del complejo de Deiland, así que relájate y ¡dale tu apoyo! We’ve had another busy week over here at The Lacuna Studios, we have been hunting high and low to find the new TLS cruise machine, we have been taking care of the fabulous Casitas Tabayesco during our workaway experience with Caroline and Rich. The Casa and Casitas have all been brimming with life, with people from all over the world. We have also taken part in our third mural since we arrived on the island, this time it was ‘Coloreamos Experiencias’ delivered through the Junt@s Somos Biosfera volunteer program with the Cabildo Lanzarote. A social intervention in Tinajo in the San Roque senior peoples residence. The mural was designed by the fabulous Jacobo Cacaeres along with the residents and was painted by the volunteers. The finished mural was in two sections a silhouetted sunset of the traditional Lanzarote landscape with a farming windmill on one side and a vibrant colourful landscape with children playing and a guitar depicting the traditional local music. The Lacuna Studios volunteered and helped deliver the murals as well as painting the courtyards and outdoor spaces of the residence. We had a wonderful time especially with the residents taking part and helping to paint the mural too, making much more personal. We can’t wait to work with Jacobo and the Junt@s Somos Biosfera program again. Hemos tenido otra semana ocupada aquí en The Lacuna Studios, hemos estado cazando alto y bajo para encontrar la nueva máquina de crucero TLS, nos hemos ocupado de la fabulosa Casitas Tabayesco durante nuestra experiencia workaway con Caroline y Rich. La Casa y Casitas han estado llenas de vida, con personas de todo el mundo. También hemos participado en nuestro tercer mural desde que llegamos a la isla, esta vez fue ‘Coloreamos Experiencias’ entregado a través del programa de voluntariado Junt @ s Somos Biosfera con el Cabildo Lanzarote. Una intervención social en Tinajo en la residencia de personas mayores de San Roque. El mural fue diseñado por el fabuloso Jacobo Cacaeres junto con los residentes y fue pintado por los voluntarios. El mural terminado tenía dos secciones, una puesta de sol silueteada del paisaje tradicional de Lanzarote, con un molino de viento agrícola en un lado y un paisaje vibrante y colorido con juegos de niños y una guitarra que representa la música tradicional local. Lacuna Studios se ofreció como voluntario y ayudó a entregar los murales, así como a pintar los patios y los espacios al aire libre de la residencia. Tuvimos un tiempo maravilloso, especialmente con los residentes que participaron y ayudaron a pintar el mural también, haciéndolo mucho más personal. No podemos esperar para volver a trabajar con Jacobo y el programa Junt @ s Somos Biosfera. Octava letra del alfabeto español; no representa ningún sonido (aunque se pronuncia aspirada en algunas palabras dialectales o de origen extranjero, como hippy o Sahara ). Su nombre es hache. If you are a creative person and have any ideas for projects, workshops, talks, seminars, lectures, constructions, showings, performances, installations, exhibitions or anything else then get in touch and let's start making them happen!